To cram all the information that you need onto one screen, Samsung takes the modern approach to screen layout of the Samsung Galaxy S 5. 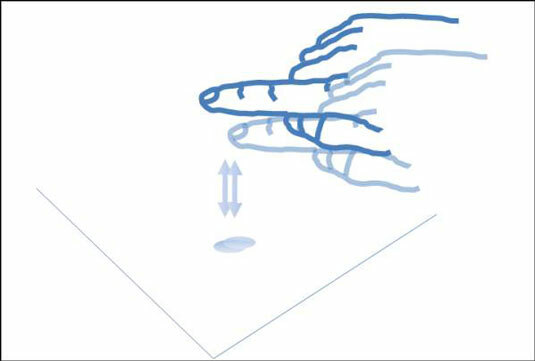 You’ll want to become familiar with several finger-navigation motions used to work with your screen. Icon: This is a little image. Tapping an icon launches an application or performs some function, such as making a telephone call. Hyperlink: Sometimes called a “link” for short, a hyperlink is text that performs some function when you tap it. Usually text is lifeless. If you tap a word and it does nothing, then it’s just text. If you tap a word and it launches a website or causes a screen to pop up, it’s a hyperlink. With this background, it’s time discuss the motions you’ll be using on the touchscreen. Often you just tap the screen to make things happen (as when you launch an app) or select options. Think of a tap as like a single click of a mouse on a computer screen. A tap is simply a touch on the screen; much like using a touchscreen at a retail kiosk. One difference between a mouse click on a computer and a tap on a Galaxy S 5 phone is that a single tap launches applications on the phone in the same way that a double-click of the mouse launches an application on a computer. For example, when you press and hold on an application on the Home screen (the screen that comes up after you turn on the phone), a garbage-can icon appears onscreen. This is to remove that icon from that screen. And when you press and hold an application icon from the list of applications, the phone assumes that you want to copy that application to your Home screen. The same concept works on your phone. To overcome the practical realities of screen size on a phone that will fit into your pocket, the Galaxy S 5 phone uses a panorama screen layout, meaning that you keep scrolling left or right (or maybe up and down) to access different screens. The simplest finger motion on the phone is the drag. 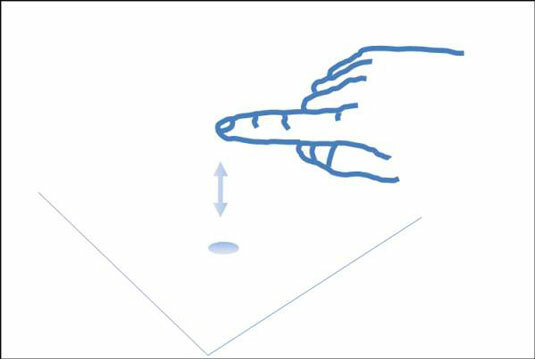 You place your finger on a point on the screen and then drag the image with your finger. Then you lift your finger. To zoom out, you put two fingers (apart) on the screen and pull them together to pinch the image. Make sure you’re centered on the spot where you want to see in more detail. The opposite motion is to zoom in. This involves the stretch motion. You place two fingers (close together) and stretch them apart.